It’s always been somewhat of a joke that I am a dentist fighting kids’ cavities by day and a baker serving up sugary treats at night. But the fact of the matter is, childhood caries (the disease that causes cavities) is really no laughing matter. February is National Children’s Dental Health Month, and I figured it was about time I confronted the irony of my blog, and talk a little more seriously about tooth decay. Childhood caries is the most common chronic disease in children, affecting half of our country’s kindergartners, and is four times as prevalent than childhood asthma. At my residency program I work with a low income population of kids that has a lot of cavities that cause pain, missed school, and even hospitalizations. It’s heartbreaking, but working in this profession, and especially with kids, there’s a lot of hope for improving habits and getting kids into healthier habits for their future. 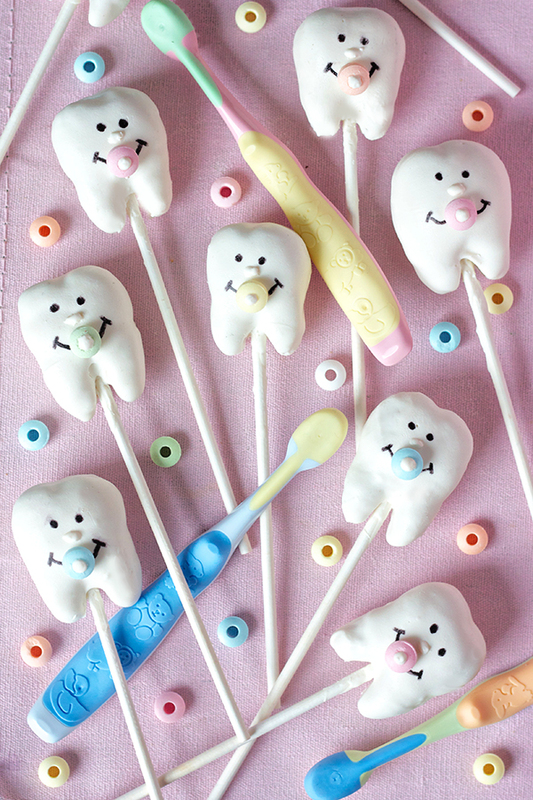 I love what I do, and I really, really love baby teeth, so it was only a matter of time before I made baby tooth cake pops anyway, right?? I spend most days either fixing cavities or talking parents’ heads off about cutting back on juice and brushing more to prevent cavities. Sometimes I fear that if they ever see this blog, or even peek into the back break room where we eat a lot of sweets, they’d totally stop listening to me. Why take medical advice from someone who doesn’t even practice what they preach? It’s definitely ironic, but oral health is all about balance. Frequency of sugar exposure is a very important factor for cavities, and kids that walk around with a sippy cup of juice all day are more likely to be affected by caries than someone who has a piece of cake with lunch once a week. Your saliva can only keep up with so much sugar before the acid from bacteria take over and make your mouth a cavity-forming reservoir. Fluoride helps shift this balance in your favor, and that’s why we’re so annoying about pushing fluoridated toothpastes and water across the board. Fluoride is the pediatric dentist’s best friend! And sealants, too. 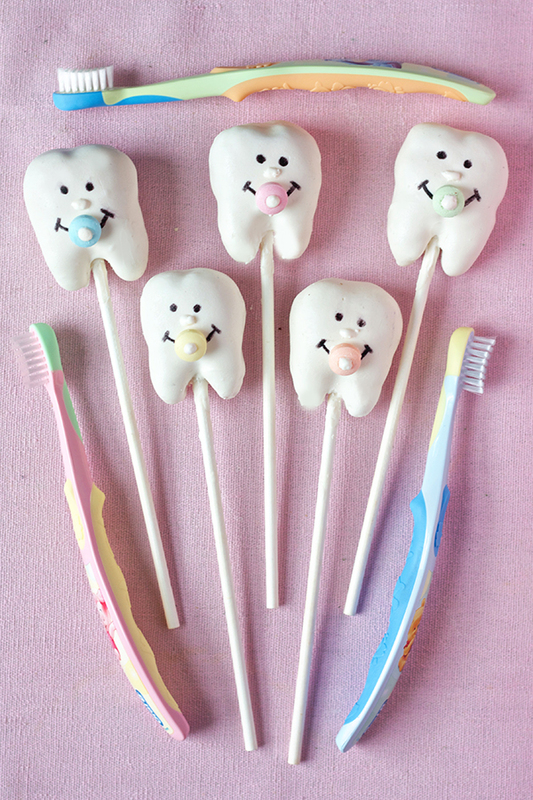 Preventing cavities is much more fun than fixing them, trust us :) So go ahead and eat a cake pop, but preferably have it with a meal, plenty of water, and make sure to brush with fluoride toothpaste shortly after. I could go on and on and on about oral health, but I bet most of you know a lot of this anyway, or can consult your dentist or your child’s dentist for even more tips. 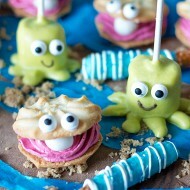 So I’ll talk a bit about what you’re really here for – the cake pops! 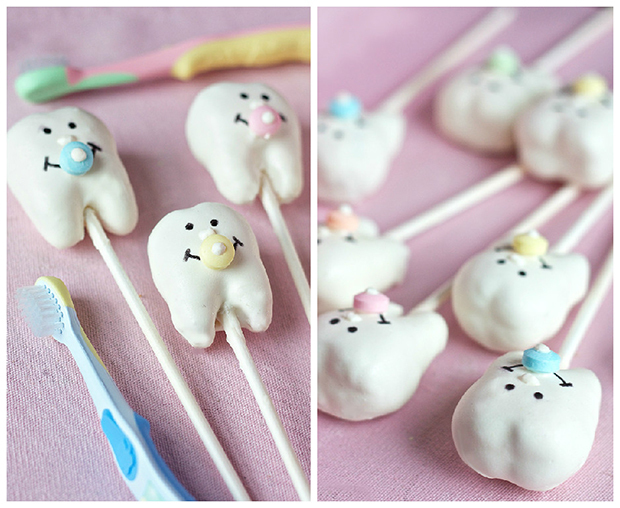 I’ve seen tooth cake pops before and of course Bakerella’s adorable baby cake pops, so I combined ideas from each to create these cute little baby teeth cake pops. Now that I’ve done tooth cupcakes, tooth cookies, chocolate teeth, and now tooth cake pops, I’d say I’m almost at my tooth dessert capacity! 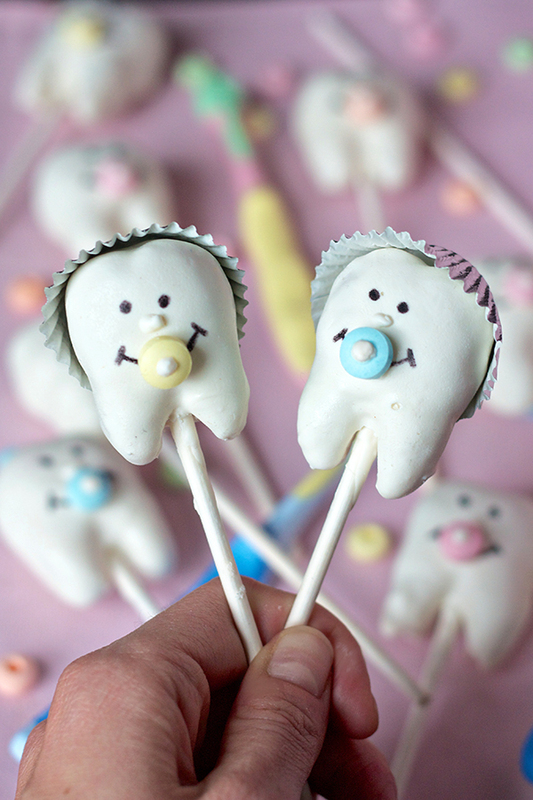 To make these cake pops, you form cake ball mixture into molar shapes (primary second mandibular molars if we’re being specific here), dip them in white candy melts, and decorate with an edible marker and candy necklace pieces to make smiling pacifier faces. My favorite baby cake pops that I’ve seen online also wear cupcake liner bonnets, so I had to stick a few metallic ones on to make stainless steel crown caps for my baby teeth. Anyone who knows pediatric dentistry will appreciate that little connection! I was drawn to pediatric dentistry because with young kids there is always the chance for improvement and the hope for achieving future health. A lot of dentistry involves fixing problems that have already caused pain and decay, so I like getting to help kids make changes so they never have to experience that. And if they do have some hiccups as a child, they get a whole new set of teeth by the age of 13 with another chance to start over. Just remember – bring your child for their first dental visit by their first birthday, brush twice a day with fluoridated toothpaste (but vary how much depending on the child’s age), and limit sugary snacks and drinks as much as possible. You may think with all the advances with fluoride that childhood dental decay wouldn’t really be an issue in the 21st century, but we continue to fight the disease, especially in low income areas. 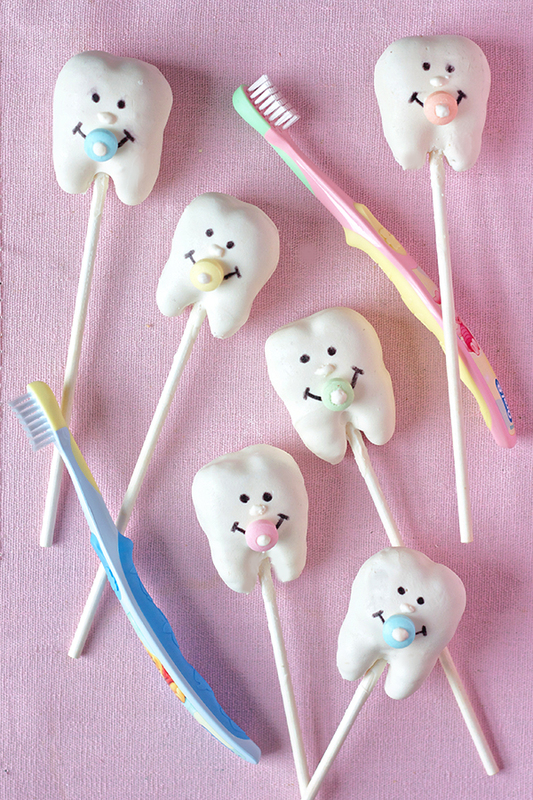 So spread the word and help raise awareness about the severity of childhood caries – baby teeth are too cute to not protect! Bake cake according to package’s instructions and allow to cool completely. Crumble baked cake with your fingers and mix in frosting until a malleable dough forms. Form dough into tooth shapes (this can be challenging, even for a trained dentist - I found it easier to form the crown and roots all together, rather than sticking on the roots after the top part was formed. 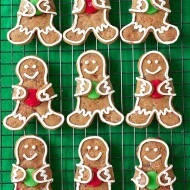 Play around with the dough until you get a shape you like!) Place on a wax-paper lined cookie sheet, and refrigerate for 30 minutes. Melt the rest of the candy melts in a deep bowl. 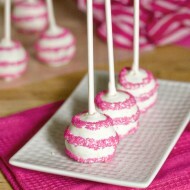 Submerge each cake pop in the melted candy and gently tap the stick on the side of the bowl to help shake off any excess coating. 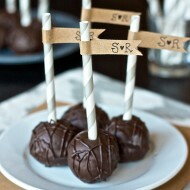 Stick the covered cake pops into the styrofoam to allow the candy melts to set. Transfer to the fridge for 30 minutes to make sure the chocolate is completely set. I am OBSESSED with these! Such a cute idea. 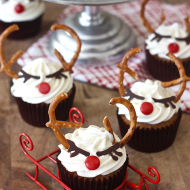 I am always teased, as a dental student who constantly bakes, so I appreciate this! Hahaha, this is just TOO funny! 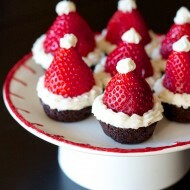 Now I know where to find my dessert inspiration for all those upcoming pre-dental society parties, meetings and clinics! 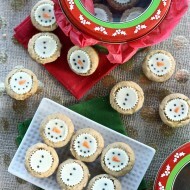 My kids saw these as I was checking out your blog and they LOVE your idea. 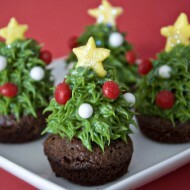 Hope to make some this weekend. Love your blog Erica! This is a really cute idea! 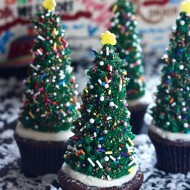 But I am too impatient a baker to make these! !